When I came up with the idea of jewelry capsules I knew I wanted to dedicate at least one Capsule to the concept of stacking jewelry. I love stacking jewelry because it achieves texture, allows for easy mixing of metals, and most importantly facilitates the reuse of things you already own. Part of the reason I wear jewelry is to create visual interest. If you’re familiar with the concept of pattern mixing with clothing, stacking jewelry is quite similar. When you stack jewelry, you’re creating a new visual texture with pieces you already own. Imagine wearing a single thin chain necklace that you already own. Now imagine that you pair it with two more necklaces from your own closet. Not only have you changed the look (three necklaces are more visually interesting and dramatic than a single strand), but you’ve also reused and re-worn two other pieces on a day that they may have otherwise sat in your closet! Now let’s take this one step further and imagine that you mixed two different metals - that one of your necklaces is silver, and two are gold - that’s another look that’s quite different from the monochromatic look created by stacking the same metal. Capsule TWO’s Medium Silver hoops include a pretty cutout design that makes these hoops look incredibly delicate. They have the added bonus of being lightweight - not only have I worn these for a full 24 hours, but I’ve comfortably slept in these as well. I’ve also been pairing these with our Small Silver Hoops. The small hoops are shorter in length but wider, creating an interesting texture when paired together. These earrings are such a classic style that they look great worn with absolutely anything. 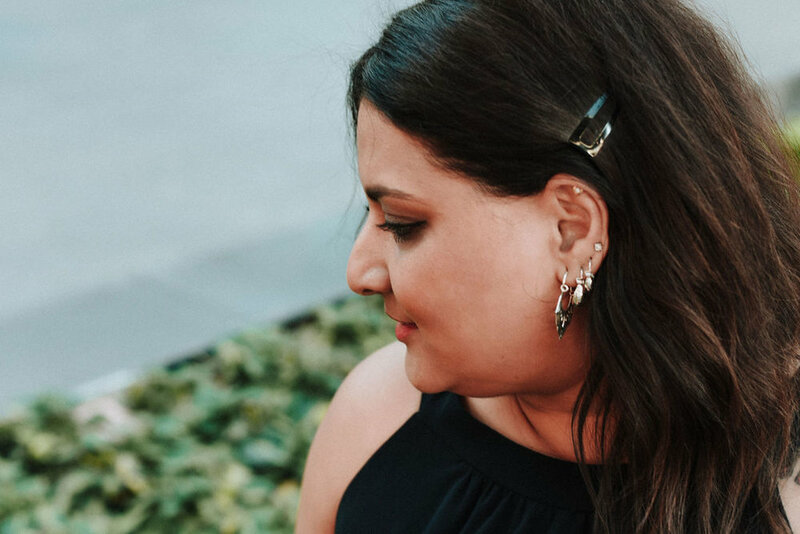 If you’re someone who likes to put in a pair of earrings and then wear them for several days or weeks without removing them, the small hoops are the perfect earrings for you. As the weather warms up and it’s time to take off your gloves, ring stacks are a great way to add visual interest to your hands. There are so many ways to stack rings - a quick glance at #showmeyourrings over on Instagram will give you plenty of ideas. 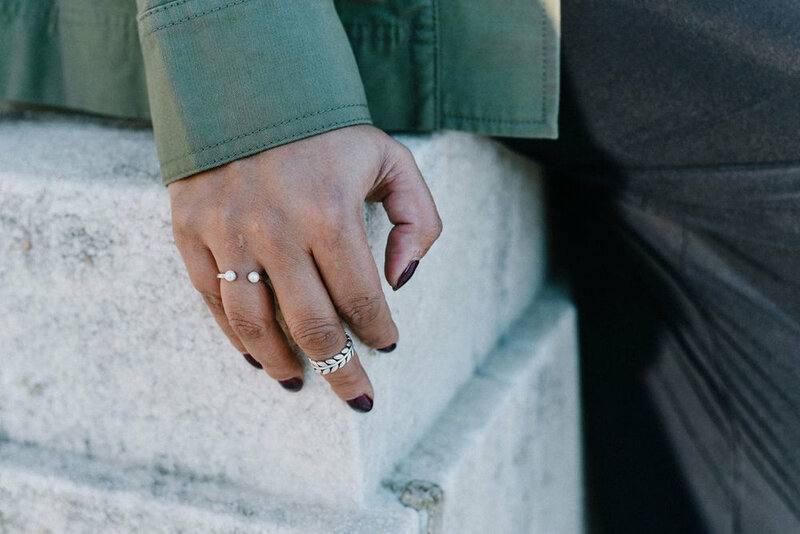 I love the idea of stacking a pearl ring along with a wide band, and that’s exactly what you get with our Capsule TWO Duo Rings. I’ve been wearing these stacked on my right hand to balance out my wedding ring, but I’ve also played around with wearing the pearl ring on my left hand and the leaf ring worn as a midi ring, stacked with other rings on my right. Both rings are adjustable so you can size them to the base of your finger or wear them as a midi ring, depending on your finger-width. Overall, I love CAPSULE TWO because of how much fun you can have playing around with it, and mixing and matching with other pieces you already own. It’s like playing dress up for adults! If you’re interested in a closer look please check out Capsule TWO on our Shop page!